Mention the word farm and E is totally game. 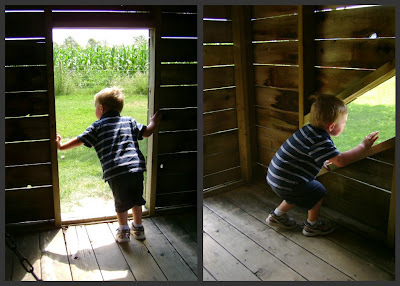 Last weekend he was a bit confused as to what farm he was going to - Grandma and Grandpa's or the Agricultural Museum? 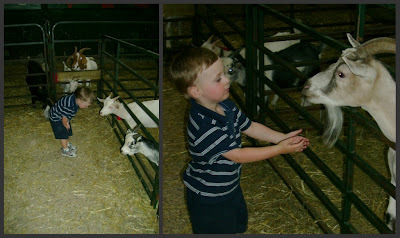 It was neither - I switched it up and we made a trip to the Valleyview Little Animal Farm. We arrived when the line was forming for the Valleyview Express train ride and stayed long enough to catch a puppet show. 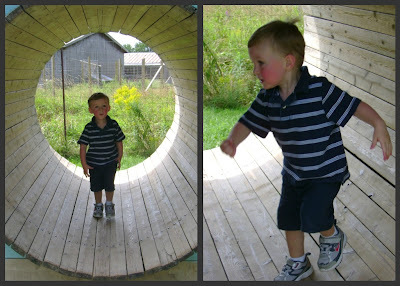 E loved both activities, but loved exploring the playground the best. We hadn't been since last July and I think E had much more fun the second time around. Being that much older and able to roam and climb on his own, he had a blast. 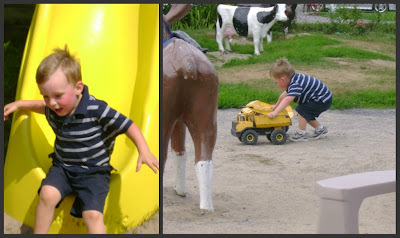 Just like last year though, he drove every play truck and tractor there was and played in each play house and barn. It was so fun seeing how this place will never get tiring! This visit was kind of last minute and I didn't have it on my Summer of Awesome list, but it is definitely a place we will visit each year.